Reading community: Assistant principal for curriculum Scott Booth (second from left) and principal Les Conroy (fifth from left) join students at St Thomas More College for 15 minutes of reading. 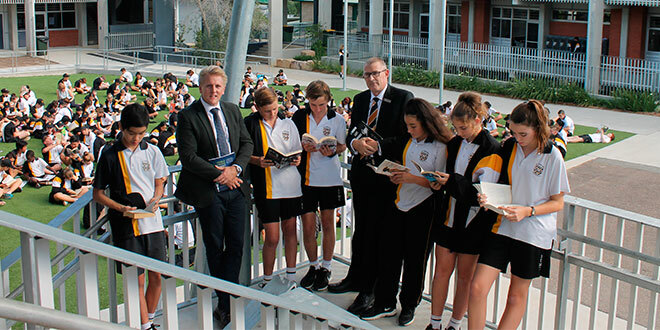 STUDENTS and staff at a Catholic school in Brisbane are taking inspiration from their saintly namesake and hitting the books in an effort to improve literacy skills and general wellbeing. The entire community at St Thomas More College, Sunnybank, which is named after well-known author and English philosopher St Thomas More, is stopping to read a book for 15 minutes every week. Assistant principal for curriculum Scott Booth is behind the school’s new weekly 15-minute reading schedule. Mr Booth said studies around the world showed reading regularly improved the academic outcome of students. “Reading is the foundation of literacy, and literacy we know is the key to educational attainment across all subject areas,” he said. Mr Booth said studies by United Kingdom group National Literacy Trust showed the long-term benefits of reading. “Everything from income to health to happiness, even life expectancy, is improved and correlates to literacy,” he said. The entire school community has taken up the reading challenge for 15 minutes after lunch every Monday. St Thomas More College is now asking parents to join in the “reading revolution”. “Read for pleasure at home, role-model to your children the benefits and importance of literacy and the reading for pleasure,” Mr Booth said. St Thomas More was an avid reader, and best known as the author of the 1516 satirical novel Utopia. Before publishing Utopia, St Thomas More studied at Oxford, becoming proficient in Latin and Greek before becoming a lawyer. He encouraged all his children, including his daughters, to pursue an education which, during his time, was uncommon. St Thomas More went into politics and was publicly known for opposing the Protestant Reformation, a decision that would lead to his martyrdom. He was canonised in 2000 by St Pope John Paul II. St Thomas More’s perseverance to change the culture of education and put his daughters through a classical education is also the vision behind the Sunnybank school that takes his name.